What do you get when you put bread, butter, bananas and peanut butter together with a skillet? 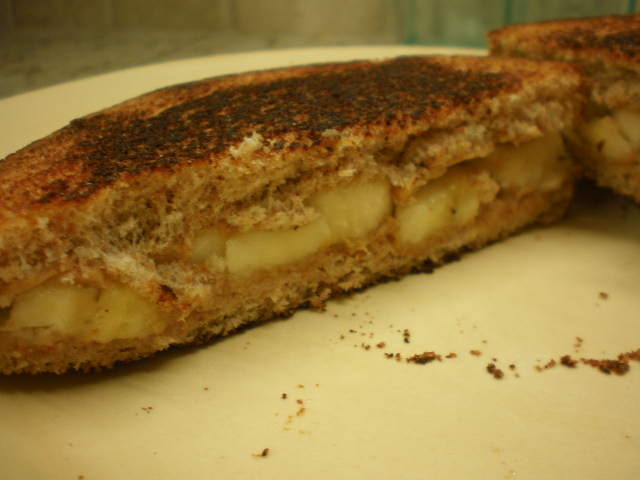 Grilled peanut butter and banana sandwich of course! I came home from work last night and could not decide on dinner. Benzo was gone so I was on my own. While I was thinking I ate a whole bunch of chips and salsa. Well after that I wasn’t that hungry. So I did a few things around the house and then came back to the kitchen a little bit later to figure out the rest of my dinner. 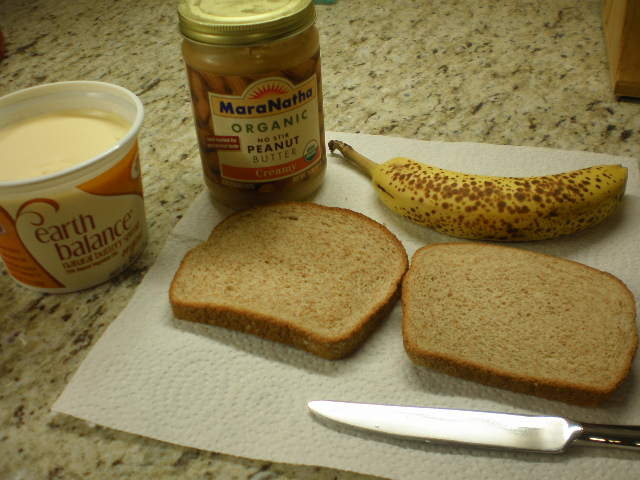 I had two bananas that were on their last legs so I decided on this PB&B sandwich. This sandwich is actually reminiscent of my childhood. 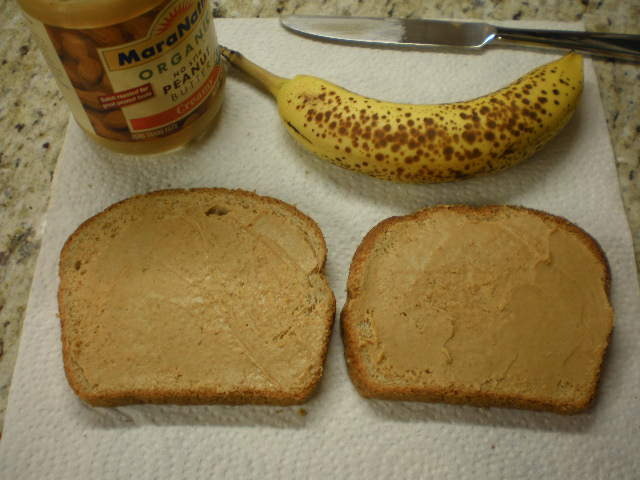 I might have mentioned this before, but Movie Mom used to make us peanut butter and banana sandwiches for breakfast. Only she used toaster waffles instead of bread and added a little sprinkle of sugar in between. Oh they were so good. 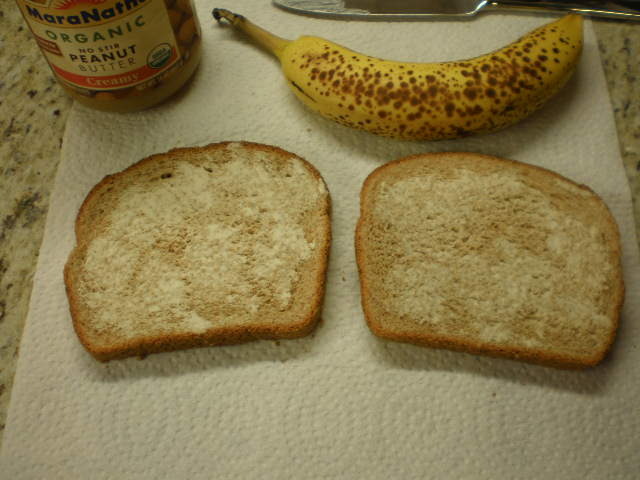 Then flip the bread over and spread peanut butter on the other side. Use as much as you want! 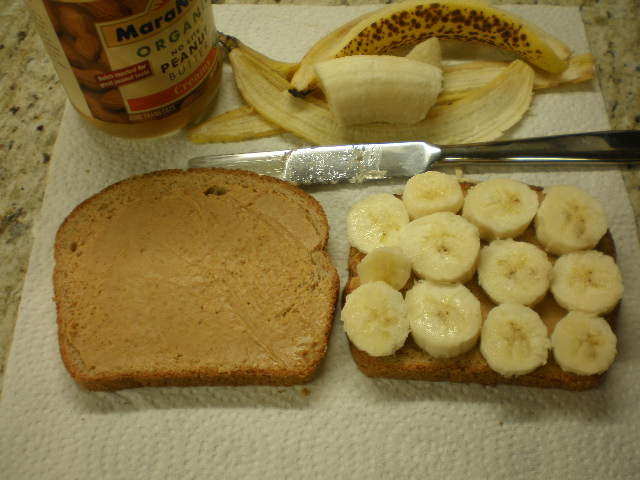 I crammed as many banana slices as I could onto the bread. I still had a chunk of banana leftover so I put it in the freezer to use in a future smoothie. 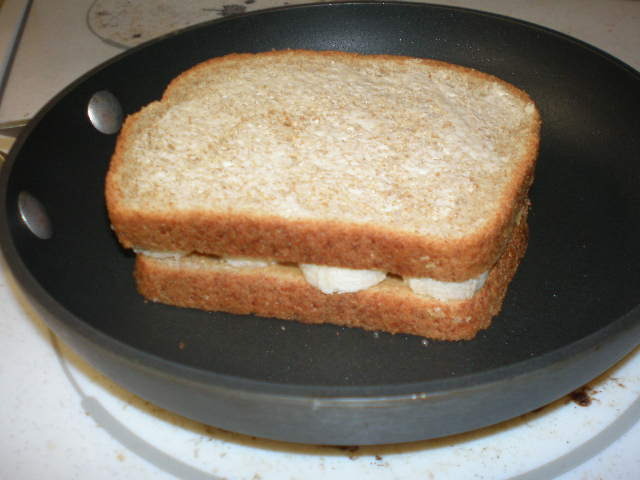 Then top with the other slice of bread (peanut butter sides in, butter sides out) and set it in a skillet over medium heat. Cook for a few minutes on each side until bread is nicely browned. It is very similar to making grilled cheese. Once the sandwich is done, slice and eat. Personally I like my sandwich sliced diagonally into triangles. I thought the sandwich was excellent, though I clearly did not use enough peanut butter. I thought it would be nice and ooey-gooey but it kind of just soaked into the bread. So next time I will double up on the peanut butter! This sandwich would be great for breakfast, lunch or in my case dinner. It was super simple to make and only took about 10 minutes. 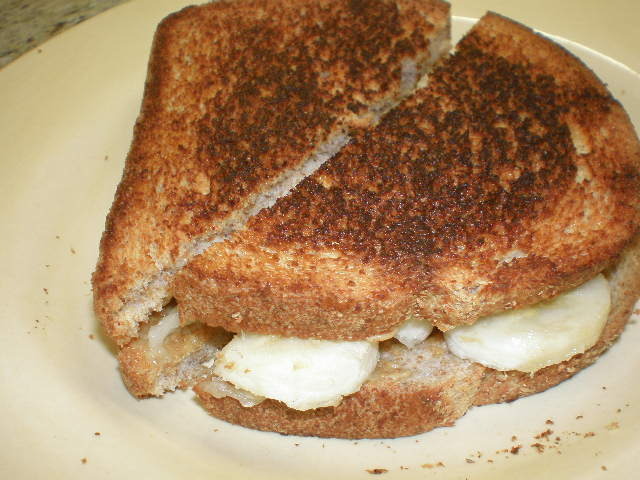 I also think it is a healthier alternative to grilled cheese. It seems like it would be kid-friendly, though I can’t say from experience since I don’t have any kids. On a different note, you may have noticed that I haven’t been blogging with my usual frequency lately. Truth is, I’m in a bit of a blogging slump. I haven’t been cooking much lately and my garden is finishing up a disappointing year. Those two things have left me with a lack of inspiration these past few weeks. I used to think I had to blog everyday and put out great content and ideas all the time. That thought stressed me out a little. While I still want to do that I’ve realized that blogging is not my job, it’s my hobby! And hobbies are supposed to be fun and enjoyable. Personal Stories – stuff that’s happened to me! Is anyone interested in reading about any of that? Is there anything else you might like to read about? Or do you think I should just stick to the topic of Everything is Homemade? That sandwich looks great! (although my husband would want to add bacon) I would love to read about any of the topics mentioned especially organizing and getting rid of clutter. I personally just enjoy keeping up with you guys. I enjoy all of your posts and would would enjoy all the other topics you mentioned as well! You’ve now motivated/inspired me to make something grilled for lunch with my kids!! 🙂 Thanks! Amy!! You’re so funny. I think that the way you describe things and tell stories is great… and whether you are “on topic” with Everything is Homemade or not… people will still read and enjoy your blog! Keep telling your funny stories. I love everything! Ooh I’d love to hear about running and minimalizing! Glad you’re coming up with alternative things to write about because you’d be missed!